Powerful WEB software to make your cleaning business more efficient. Now you can easily record and view info on every cleaning job you have done: floor care, carpet care, self-employment, window washing, custodial training and many other areas related to the cleaning industry. You can use the scheduler to find the best fit by viewing dates, times and distance of other scheduled services to set an appointment for a customer. Each customer's history is stored and conveniently displayed on the customers main screen for ease of look up. This historical recount is complete and permanently stored with each customer for quick reference. It's perfect for workers to plan working hours so that the orders do not overlap with someone else and keep track of scheduled appointments. It'll store the information about clients, such as their address, telephone, email and comments. This modern and extremely handy program makes management a real pleasure. The program has a handy interface to calculate and show the "fee charged", helping you to make decisions quickly. Available is an automatic search and auto-field filling for a customer, who has already been entered to the database. The Report Designer provides end-users with the capability to edit reports, load and save report templates, and preview and export to various formats (including PDF, XLS, RTF, MHT, Html, Text, CSV, and BMP). 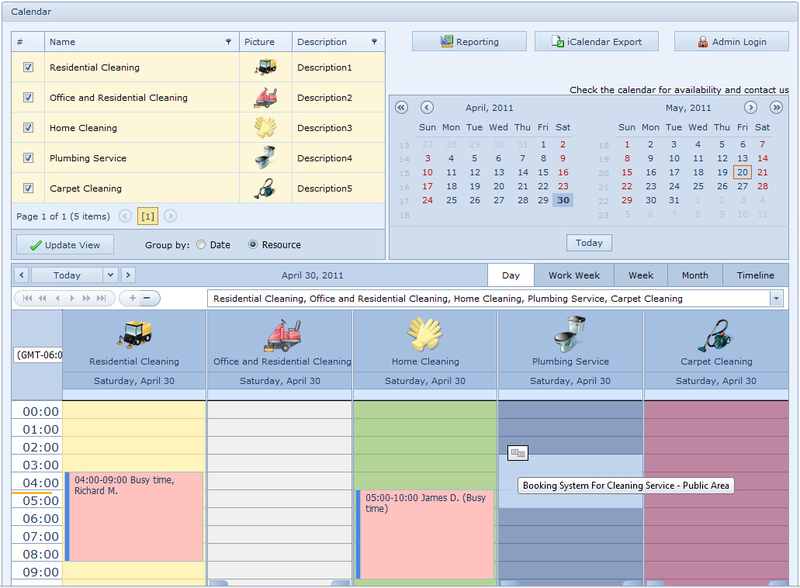 The Calendar is designed to enable the communication between different scheduling applications over the Internet. It facilitates data transfer between applications that use Scheduler and other applications, such as Apple iCal, Google Calendar, Microsoft Exchange Server, Microsoft Office Outlook 2007, Novell GroupWise, Windows Calendar. You may obtain a collection of days which are treated as holidays for the specified country, and add these holidays to the scheduler. Our programs are cross-browser compatible and are carefully tested on multiple browsers to ensure utmost compatibility. Requirements: 32 MB of RAM, 7 MB of available hard disk space.